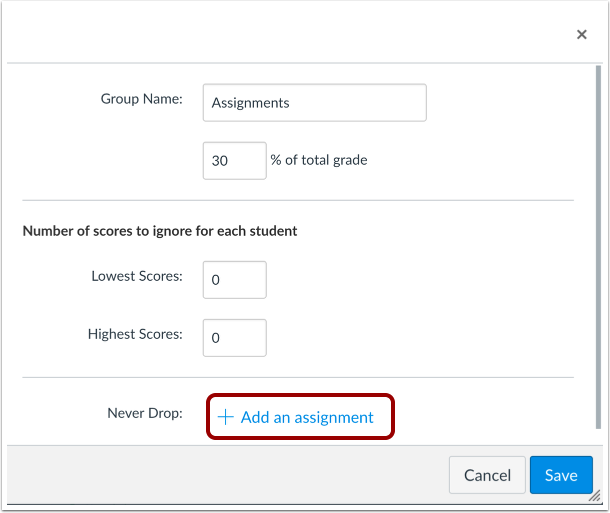 Once you have added assignments to your assignment group, you can create rules for the entire assignment group. 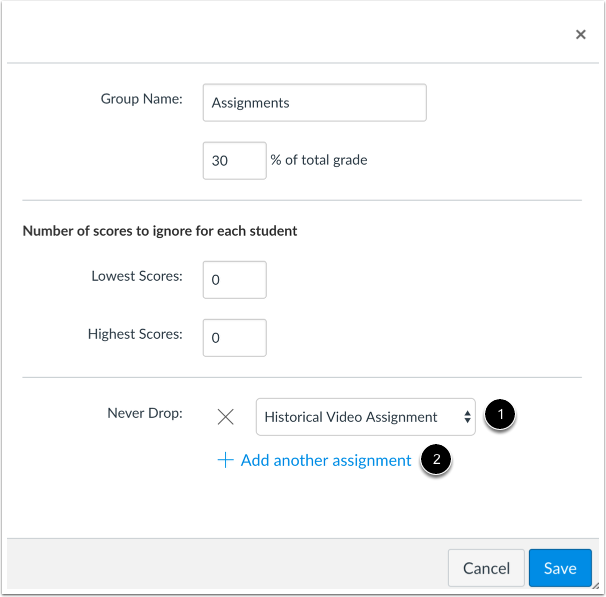 Assignment group rules determine how Canvas handles any exceptions you want to create for grade calculations. Assignment groups can be weighted or unweighted. 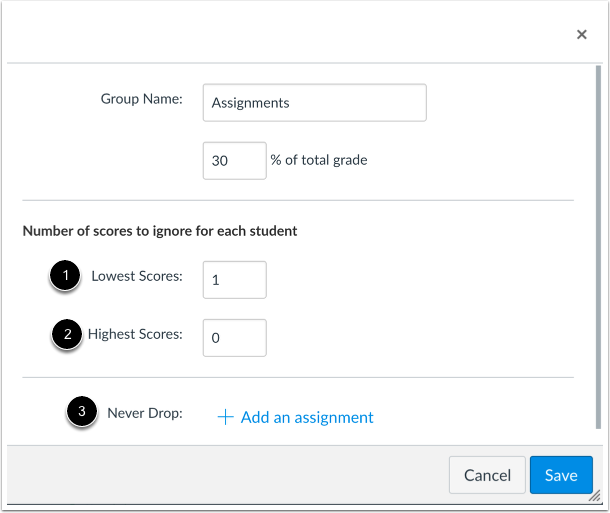 When using the lowest or highest score rule, an assignment group must include at least one score, plus the number of dropped scores and the number of assignments that should not be dropped. For instance, if you have a rule for dropping three scores and one Never Drop assignment, you would need five student scores in the assignment group to have all three lowest or highest scores dropped. Canvas considers how the rule most negatively or positively affects the student's overall score. A rule to drop the lowest score will remove the assignment score(s) from a student's group percentage calculation that will result in the best possible score for that group. 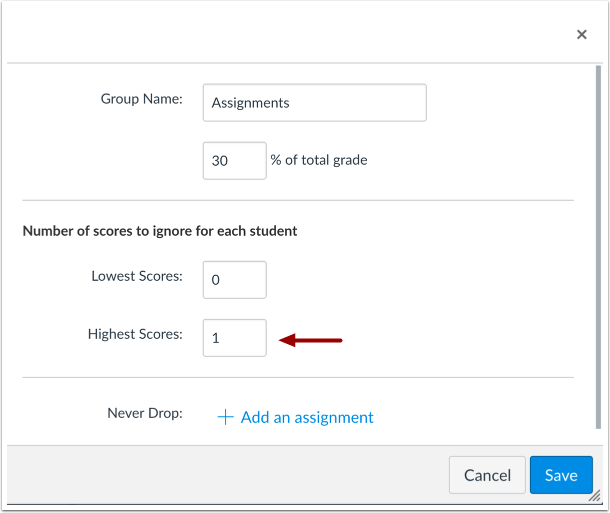 A rule to drop the highest score will remove the assignment score(s) from a student's group percentage calculation that will result in the lowest possible score for that group. Dropping both the lowest and the highest score(s) removes any outlying scores and calculates a student’s grade based upon the remaining middle scores. 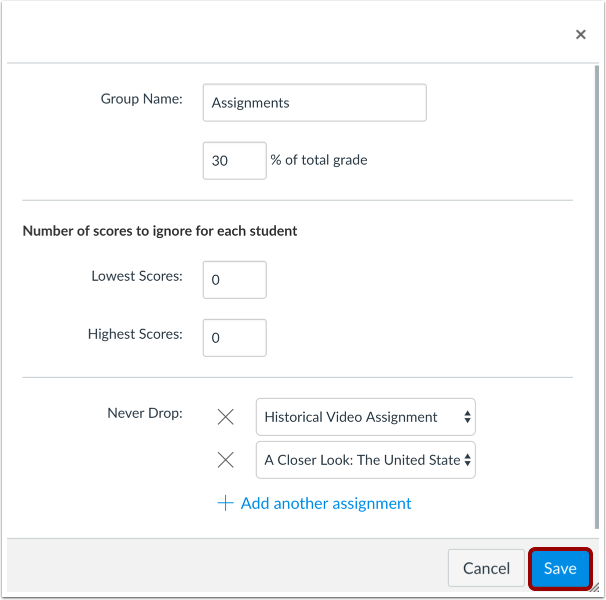 If your course includes Multiple Grading Periods, you cannot change assignment group rules once an assignment group has assignments in a closed grading period. Additionally, if an assignment group contains assignments that fall into multiple grading periods, grades may have unintended consequences when calculating assignment group rules. Click the Assignment Group Options drop-down menu . Click the Edit link . To drop a certain number of lowest scores, enter the number in the Lowest Scores field. You can use the arrows to adjust the number. To drop a certain number of highest scores, enter the number in the Highest Scores field. You can use the arrows to adjust the number. 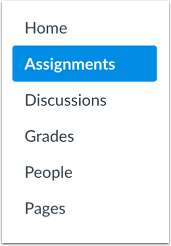 To tell Canvas to never drop a certain assignment, click the Add an assignment link. In the Assignment drop-down menu , select the name of the assignment in the Assignment Group that should never be dropped. To select another assignment, click the Add another assignment link . When you are finished adding rules, click the Save button. In the Assignment Group toolbar, Canvas will show the number of rules assigned to the group . Hover over the link to view the rules . Previous Topic:How do I weight the final course grade based on assignment groups? Next Topic:How do I create an online assignment? Table of Contents > Assignments > How do I create rules for an assignment group? Is there any way Canvas can work on the ability to drop a certain section's assignments? So let's say hour 1 gets one dropped grade, but hour 2 keeps them all? Not sure if this has been submitted as a feature idea as I did not see it in my brief search. I was not able to find an existing feature idea in the Studio, but I think that sounds like an awesome idea. Feel free to go submit it as a new feature idea in the Ideas . I know it's only been a short week since we replied to your comment, but I wanted to reach out and make sure that you were able to create a new feature idea. Please let us know if there's anything else we can help with or if you have any further questions. We periodically remove comments from the Canvas Guides. If your comment thread here disappears in several weeks, you'll know that we've just done some housekeeping in an effort to keep the guides updated. Re: How do I weight grades? Dropping the lowest score exemption.